LAHORE: The police in Layyah on Friday arrested another person from the district’s Kot Sultan area, accusing him of blasphemy, Station House Officer (SHO) Rauf Khalid told Daily Times. The man, Mubashar Ahmed (45), is the fifth person of the Ahmadiyya community to be detained in the blasphemy case since Wednesday. Four other minor boys, aged between 14 and 16, have also been charged in the case under Section 295-C of the Pakistan Penal Code. According to the First Information Report (FIR), the boys are accused of writing blasphemous material in latrines of Kot Sultan’s Gulzar-e-Madina mosque. The boys are students of grade nine and 10 at the Superior Academy in Chak 172/TDA of Layyah. Remand: The SHO said he had obtained a two-day remand of the boys, adding Layyah District Police Officer (DPO) Dr Muhammad Azam and Dera Ghazi Khan Investigation Police Superintendent (SP) Pervaiz Tareen were heading the probe. Tareen said he had returned to DG Khan after completing his probe on Friday, adding he had appointed a deputy SP to conduct the remaining investigation. The SP said he would not question the accused boys anymore, but refused to disclose his findings. A group of lawyers on Friday announced to argue the boys’ case for free, while a press release by the Asian Human Rights Commission (AHRC) condemned the charges against the four boys. Pressure: After contacting the Layyah DPO, the boys’ relatives were told that the police were under pressure from fundamentalists to act against the boys, AHRC said in the statement. “The DPO said if he did not arrest the accused, the group had threatened to seal the city and attack the houses of Ahmadis. Worried about civic unrest, the officer arrested the children,” the AHRC said. Evidence: It said no evidence had been provided prior to the five arrests. However, Kot Sultan SHO Khalid told the AHRC that the gravity of the case justified the arrests. According to an amendment made by parliament in 2004 in Section 295-C of the constitution, the police are bound to thoroughly investigate blasphemy accusations before levelling criminal charges. The aim of the amendment was to reduce the scope of the blasphemy laws, which are still widely and frequently abused, and often result in death penalties. 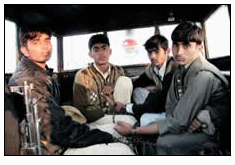 The AHRC urged President Asif Ali Zardari to immediately intervene and order the release of the detained people.